X-Men Unlimited #48 Cover. 2003. Oil on masonite, 12 × 18″. While digging through the archives the other day, I stumbled upon some old reference for this cover, painted while I was a senior at RISD. 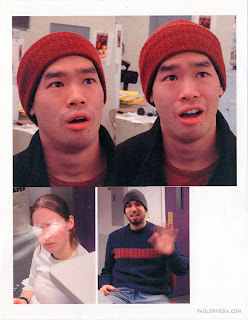 I spend most of my time working alone now (sniff), but back in those days, the Illustration Building 4th floor studio was a lively place filled with friends and constant inspiration. 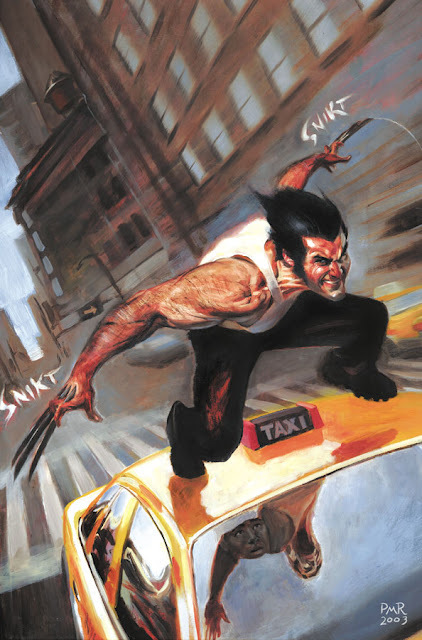 I asked one of those friends, Go Sugimoto, if he would like to ride shotgun in the cab Wolverine was surfing. I asked my friend, Maris Wicks, to print out this reference for me in the computer lab. Somehow, a picture of her with glowing eyes and a blurry-handed Juan Diaz ended up on the print. Or something like that—it was a long time ago. You can see me posing as the Clawed Canuck on Wacky Reference Wednesday #20. Speaking of RISD, my Captain America movie poster will be on display in Providence for the ICON 7 show. The opening is June 13th—I'm going to pretend it's a college reunion. Yeah! Can't wait to see you! Ditto. I'll have a GL/Spidey print for you as well. See you soon.